Brothers in Fine Food cafe (BFF) is situated on the second storey of Tampines West CC. On the first floor, there is a kiosk called Alt Yard, which sells churros (this is important for the later part of the review). Both BFF and Alt Yard are under the Muslim-owned Penny University. BFF has an eclectic, and perhaps eccentric, decor. The floor is cement and the lamps look like spotlights used in stadium, signalling an industrial look. But I don’t understand the thick manila ropes hanging around. Are they fans of 50 Shades? At the same time, the cafe spots full-panel glass doors, contemporary wooden tables with clean lines, blue-and-white mosaic tiles; all these indicate a Scandinavian influence. Very pretty. The one-page menu is interesting and different from other cafes. 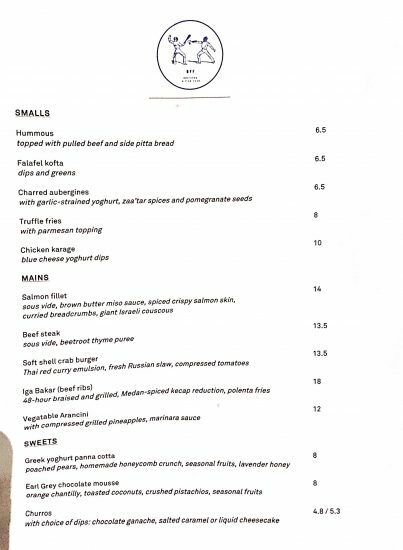 For starters, they recommend the hummous ($8.50) which comes with pulled beef and pita bread, but since we didn’t want carbs, we didn’t order it. The truffle fries ($8) is also popular, but we were bored by truffle fries. I hesitated over the chicken karaage ($10) in blue cheese yogurt dip, but in the end, I decided not to order it because I’d rather have it at a Japanese restaurant. There are only 5 mains, but there is variety, including a vegetarian arancini ($12), and they are interesting. We avoided the most boring item, steak ($13.50), but everyone on instagram ordered it and gave it a thumbs up. The iga bakar ($18) is the most expensive and most interesting item on the menu. Interesting because it is a classic Malay dish using modern Western cooking methods, reminding me of another halal cafe, The Malayan Council. The beef rib is braised for 48 hours and grilled. It should be tender, but instead, it is tough and dry, hard to cut, hard to chew, hard to swallow. The polenta fries beside the rib taste like a terrible steamed chwee kway. Chiobu made a face while eating the fries. “Why does it taste like that?” she asked. We also do not understand the spicy kecap crisp at the side. How do it add to the dish? No man is an island, but this crisp seems to be an isolated island. The other main, soft shell crab burger ($13) is as lonely as the spicy kecap crisp. Now I understand why the mains are so affordable. There is no sides with the burger. The burger is loaded with a thai red curry sauce, which is nicely spicy, but the crab is too salty. “Perhaps,” Chiobu suggested, “they are good for their drinks. After all they are affiliated to Penny University.” Chiobu might be onto something because the drinks menu is very interesting. 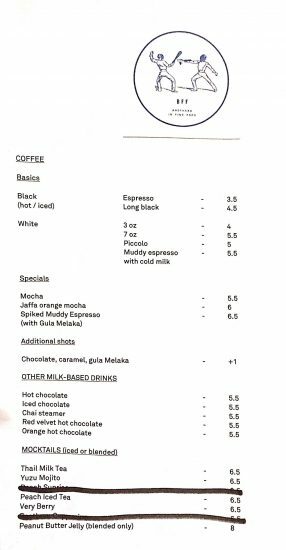 There is an expresso with gula melaka ($5.50), and a blended peanut butter jelly ($8). The red velvet hot chocolate ($5.50) is amazing. It is thick and the fragrance of the red velvet shines through. When the churros with cheesecake dip ($5.30) appeared, we were taken aback partly because it came from Alt Yard—we saw an Alt Yard staff bring it up—and partly because it was served in plastic. Given how classy the food is plated, it is incongruous that the churros come in plastic. BUT the churros are excellent. It’s still hot, it’s crispy at the ridges, and fluffy inside. None of the smelly oil stench. I didn’t like the sour cheesecake dip but Chiobu enjoyed it. This review is difficult to write because the service is extremely impressive. When we entered, it was quite empty, and they immediately put a bottle of water and glasses on our table. Chiobu was sick, and I requested to split the red velvet chocolate into two glasses, and the barista was so nice that he made two new cups for us. Another reason why the review is difficult to write is that everyone on instagram is saying nice things about the cafe; it’s always hard to be the odd one out. The service and ambience are definitely top-notched, but the portions need to be bigger. The food concept is interesting, using western cooking on Malay food, but the food needs some adjustments. We paid $42 for 2 persons.